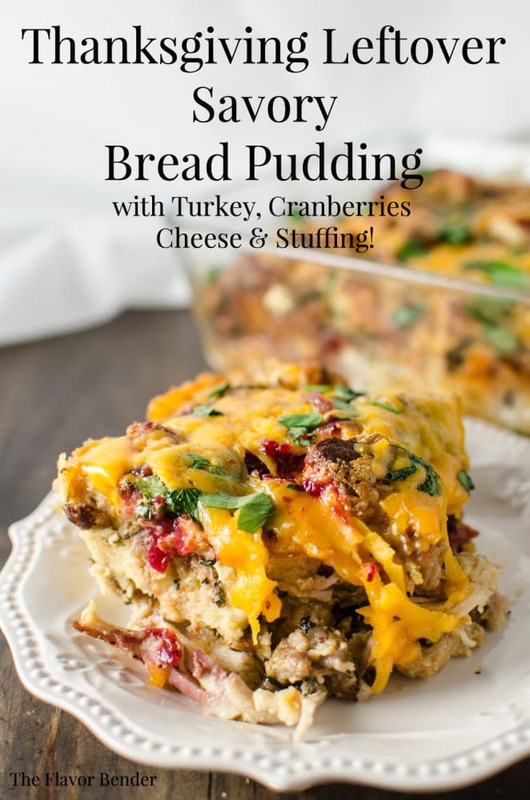 Extend the holiday cheer to the day after, by transforming boring leftovers into this delicious Thanksgiving Leftover Savory Bread Pudding – where flavourful stuffing, soaked in a herby custard, is baked with juicy pieces of turkey and sweet cranberries and then topped with melted cheddar cheese. There’s no reason why the day after brunch can’t be as good as the holiday feast itself! 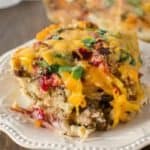 Here’s another great savory bread pudding/casserole idea to use up Thanksgiving leftovers – Thanksgiving Leftover Strata! Besides the bird and the stuffing, the one thing that’s guaranteed on Thanksgiving Day is leftovers. After all, you wait a whole year for Thanksgiving, and then you go out of your way to produce the best feast possible for your family and friends. You even call it an early night because nothing productive ever came out of staying up on Thanksgiving Day after the meal. But then you wake up the next day and face reality. There’s plenty of leftovers and the thought of eating the same thing again, makes you feel queasy. 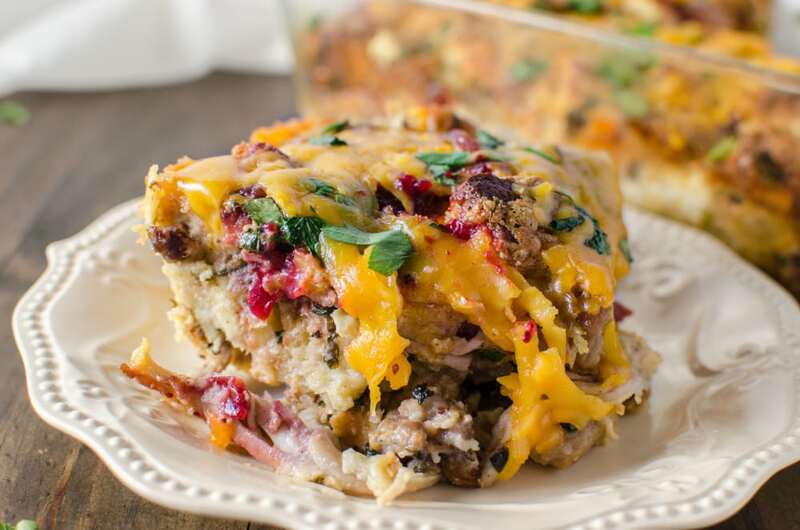 So instead of re-heating and re-serving boring leftovers, transform the remnants of your feast and extend the holiday spirit to the day after, with this fantastic Thanksgiving Leftover Savory Bread Pudding! I mean what could possibly be better than Thanksgiving dinner? 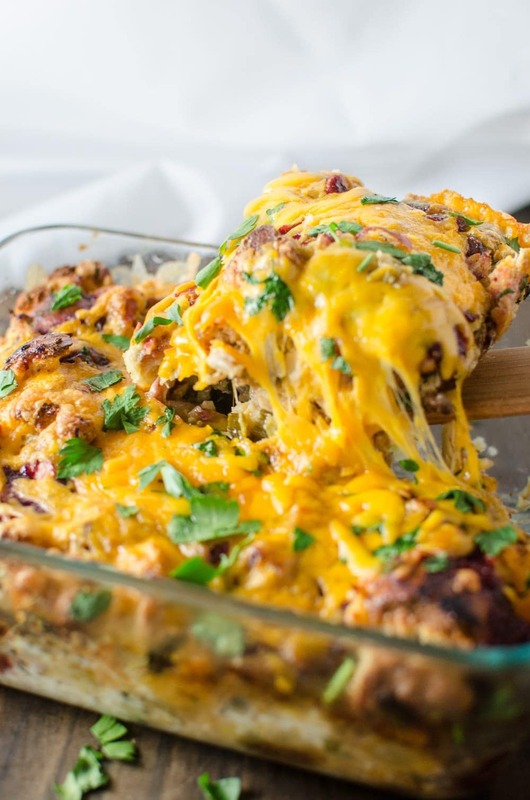 Thanksgiving brunch the following day with flavour-packed stuffing soaked in a herby custard and then studded with juicy pieces of delicious turkey and sweet cranberries and finally topped with melted cheddar cheese. Hell yeah , baby! There’s no reason to go cold turkey the day after, when the alternative is this easy and this good. And for this savoury bread pudding, I used my Pear, Sage and Sausage stuffing that I shared with you guys yesterday. But you’re welcome to use any kind of stuffing, since you will be adding more bread for this recipe too. What I do strongly recommend though is that you add some sweetness to your stuffing in the form a fruit (if you don’t already have any in your stuffing) – either pears or apples are a great option. So you have leftover chicken or ham in the fridge? Go ahead and throw that in there too. This is such a creative way to use up and transform your holiday leftovers in a really delicious way. Place half and half in a saucepan with the rosemary. Bring it to a boil and turn off the heat. Add the shredded turkey (or chicken) and let the herbs steep in the milk for about 20 - 30 minutes to infuse the flavour, and for the milk to cool down to room temperature. Then remove the rosemary sprig. Preheat oven to 350°F, and butter a 9 x 5 inch oven proof dish. Break the eggs into a bowl, and whisk them with the cooled rosemary infused milk mixture and turkey and salt. In a large bowl, place the stuffing, bread cubes, pears and parsley and mix to combine. Add the custard (milk, egg, turkey mix) and mix well to coat with the custard. Pour half of this into the buttered dish. Pour some leftover cranberry sauce on top, and place the other half of the bread pudding mix over it. Push down and leave for a few minutes to help the bread pieces soak up the custard. Spread some more cranberry sauce on top and sprinkle (generously) some cheese and a little sea salt over it. Cover with foil and bake in preheated oven for 20 minutes. Uncover and bake for a further 10-15 minutes until the cheese is bubbling and the custard has set. This I think is one of the best ways to have Thanksgiving for breakfast or brunch. Imagine how delicious this is going to be with those beautiful turkey roast leftovers? The custard adds another layer of flavour while the rosemary makes it smell that much better. By letting the turkey meat sit in the rosemary infused milk, you’re letting it soak up extra flavour while making it deliciously juicy which also prevents it from drying out. 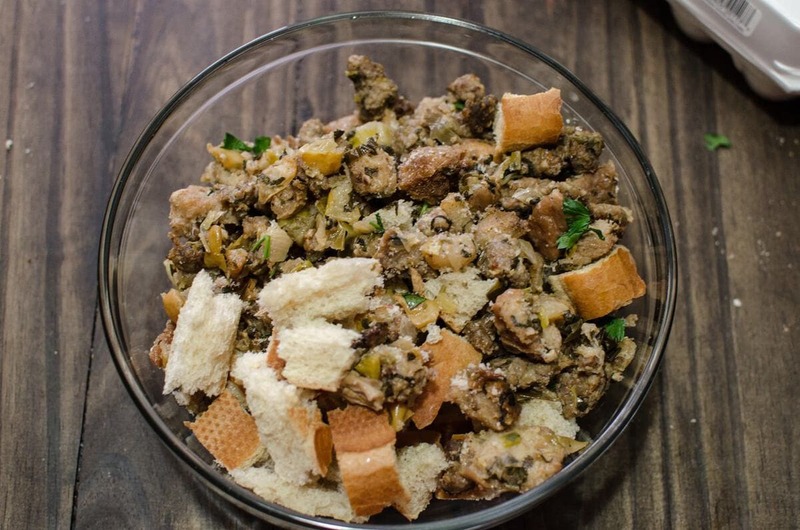 And this is all on top of the flavours of your favourite stuffing. Then you also have the added sweetness of pears (which complemented the pear, sage and sausage stuffing I used), and the tangy sweetness of cranberry sauce. This is the kind of brunch you can have all day, coupled with a nice glass (or bottle) of wine too maybe. And the kind of thanksgiving leftover recipe that ensures your holiday spirit lives on a day or two longer. So go on, pour some maple syrup on top and dig in, because you only get to eat Thanksgiving once twice a year thanks to this savoury bread pudding. 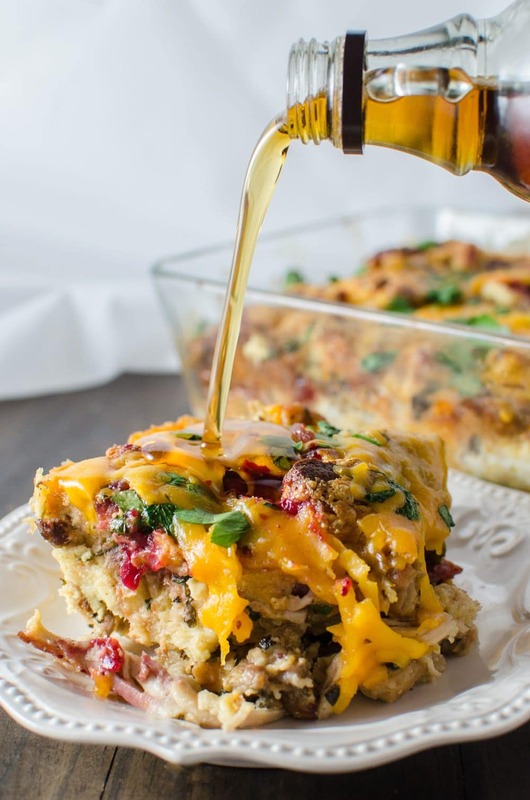 If you liked this Thanksgiving leftover savory bread pudding recipe, don’t forget to subscribe for new (and free) recipes and updates by entering your email address below (and get all these recipes delivered straight to your inbox), so you don’t miss out on a thing. You can find me on FACEBOOK, TWITTER, INSTAGRAM, PINTEREST and GOOGLE-PLUS too. I’ve been meaning to comment ever since I first saw this – sounds like a delicious dish and great use of leftovers! How cool to make bread pudding out of stuffing! 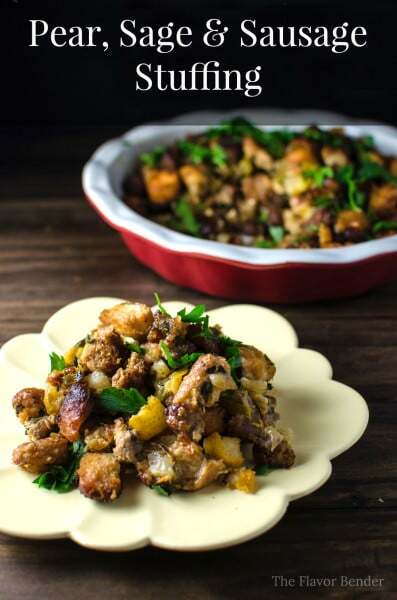 And when the stuffing has sausage like yours absolutely bring on the maple syrup…yum! 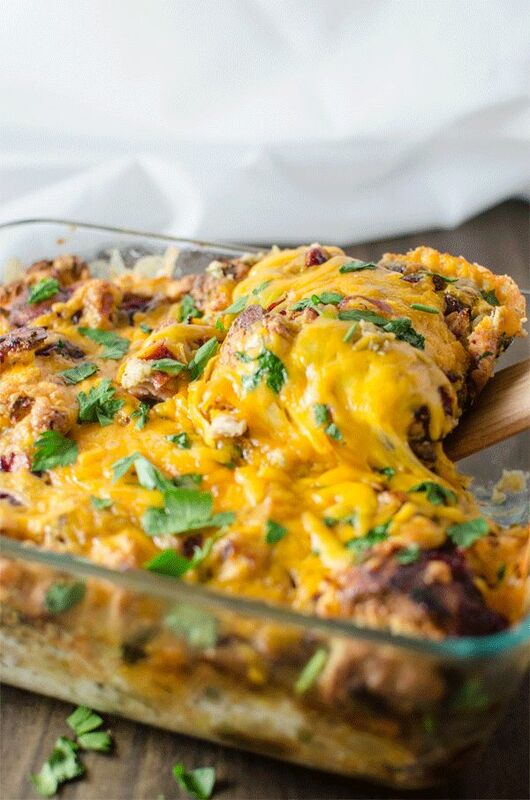 Seeing your delicious recipes make me so excited for Thanksgiving leftovers! I’m cooking so you can bet I’ll be making extra for dishes such as this one and you phyllo dish! Well said Dini! 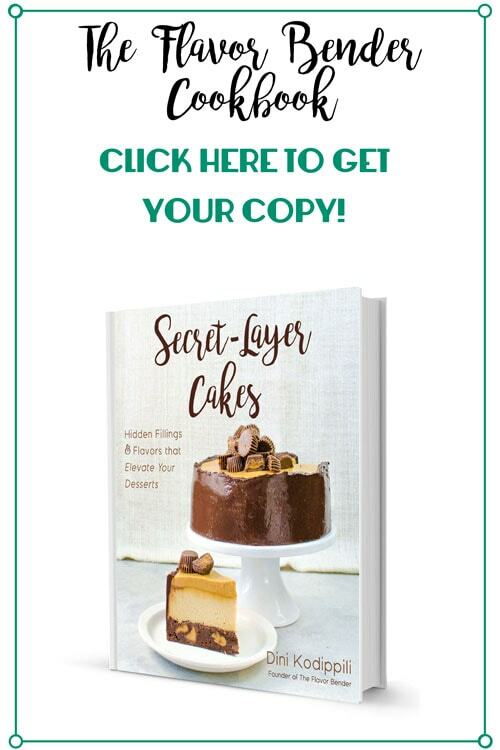 A very useful recipe! Thanks for sharing. OMG THAT LOOKS SOOOOOOOOOOO good. I love how it could be made with a variety of leftovers. I have a massive craving now! Thank you Jessie!! 😀 I like creating a challenge out of leftovers! This is such an interesting idea! Pinning it to try later this month! !